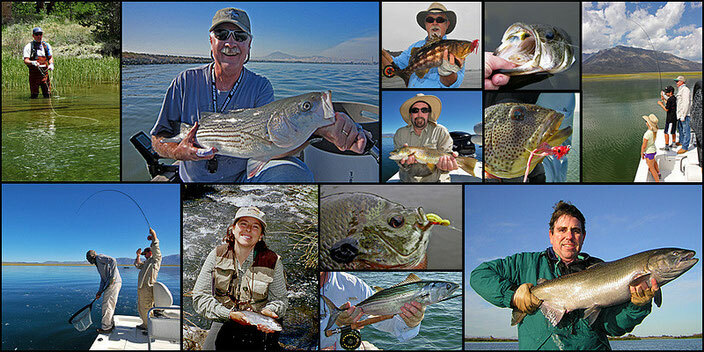 Stroud Tackle is the oldest San Diego fly shop, serving the San Diego angling community since October 1970. We are located just east of Mission Bay and only a few minutes from downtown San Diego as well as neighboring communities such a La Jolla, Mission Beach, Pacific Beach, Imperial Beach, Coronado, National City, Chula Vista, La Mesa, and El Cajon. We stock a broad inventory of freshwater and saltwater fly fishing rods, reels, lines, flies, fly tying tools, fly tying materials, and fly fishing accessories to meet your fly angling needs in Southern California, the Eastern Sierra Nevada, and beyond. The products in stock include Temple Fork Outfitters (TFO) and Redington fly rods and fly reels, Lamson and Glavan fly Reels, Rio fly lines, leaders, and tippet, and a broad range of fly tying materials and tools sourced from Hareline Dubbin, Wapsi, Cascade Crest, and Renzetti. San Diego County offers year round freshwater and saltwater fly fishing opportunities for multiple species whether angling afoot or from on the water and is about a six hour drive from the trout waters of the Eastern Sierra Nevada. From much of the city of San Diego and surrounding cities and communities it is possible to be fly fishing for largemouth bass, bluegill, carp, or saltwater species within 30 minutes. Even trout are available in local lakes during fall and winter months. Come by and visit us. We look forward to meeting you!